While you bake cookies or wrap presents with the kiddos today, here are four-fun filled episodes of a kid talk Christmas with Mr. B, Mrs. B, and Caly. Listen and rejoice! Kids, are you ready for Christmas? Grab your Christmas snacks and gather ‘round to enjoy a one-of-a kind telling of the Christmas story with Mr. and Mrs. B. Merry Christmas boys and girls! Christmas Afternoon Tea: an old tradition with a new generation. Christmastime puts parents in a tough spot. We love our children. We want to give them good gifts. We enjoy their eager anticipation and exuberant gift opening on Christmas morning. And yet as Christian parents, we know there is a dark side to gift giving: greed. All of the presents can seem little more than brightly wrapped packages of temptation. There are temptations to selfish delight or despair, depending on whether or not our children got what they wanted. Greed can take hold, turning what we intend as a blessing into what feels like a setback in our parenting. 5. Read Christmas Giving Stories. 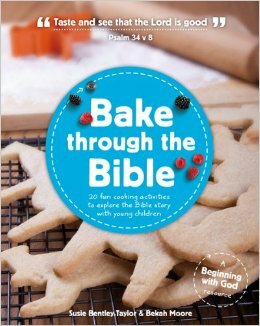 A great addition to Christmas story time: books that highlight the joy giving such as Little Women, The Gift of the Magi, If You’re Missing Baby Jesus, Christmas Day in the Morning and many more. Powerful stories can help awaken children’s imaginations to the magic of giving. 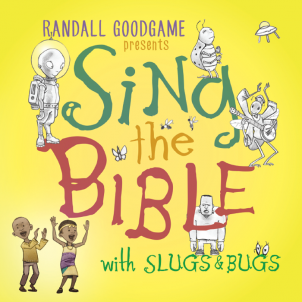 We are huge Slugs and Bugs fans around here and we’ve been waiting a long time for this album. Eighteen Scriptures set to some great music. My parents gave us gifts that would make memories long after Christmas and this gift does just that. My girls are going to love trying some of these recipes. 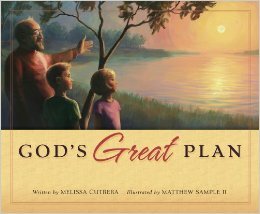 This book is beautifully written and illustrated to tell the storyline of the Bible. I plan to re-read it regularly to my children. I’m assuming you already know about these books from Andrew Peterson, but just in case one or two of you haven’t heard of them, I mention them here. 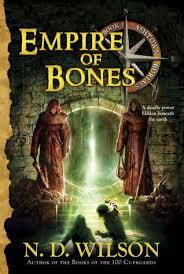 My son has worn out books one through three and is counting down the days until the release of book four. 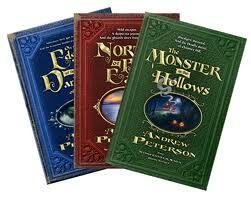 I’m also buying this series for my oldest, but to be honest, it’s really for me. 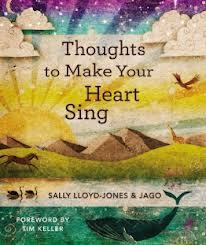 From the beloved author and illustrator Sally Lloyd-Jones and illustrator Jago comes this exciting new book. No, it’s ok, they stayed out in the snow for a full 10 minutes. A few days before Thanksgiving, I received a message from a soon-to-be adoptive mother with the good news that she and her husband had recently accepted a referral for a five-year-old boy in Ethiopia. She asked me for advice on bringing home an older child, as she already has several children at home. I thought I would share my letter with you. I am thrilled to hear your news! Your message brought a smile to my face, because it was almost exactly two years ago that we first met our Jude and Sophie. We’ve been reminiscing a lot as a family this week and rejoicing in God’s goodness. I am so excited as I think of the joy you will soon experience as you welcome your new son into your family. My counsel is first to pray for wisdom and strength, because you will desperately need both. Accept all offers of meals or house cleaning you receive. Keep things very simple (paper products from Costco are a great investment). Don’t plan on going anywhere for a while, except church and the doctor’s office. Enjoy these weeks of intense focus on your precious family. And remember that it won’t always be like this. You will feel rested again. Life will feel normal again. Just maybe not as soon as you expect. 2. Love to feel (and not the other way ‘round). Your task is challenging and glorious, but it is also clear: to love your child according to God’s Word. Lavish him with affection and encouragement. Serve him with cheerful sacrifice. And don’t waste time examining your emotions, worrying about how you feel, or grasping for an ideal experience. It was not hard to fall in love with my children, and you may feel an instant connection and deep bonds of love with your child; or your motherly emotions may come more slowly, as you love and sacrifice for your son. It helps to remember that our feelings are not the measure of true love or of the success of our adoption. In fact, by paying too much attention to how we feel, we can get tangled up in a mess of anxious wonderings that leave us feeling confused and distract us from genuinely loving our child. As C.S. Lewis wisely observed, “An obligation to feel can freeze feelings.” (HT: Sally Lloyd-Jones). The question is not: “Do I feel motherly love for this child?” but “How can I show motherly love to this child?” If we choose to love our children, we can be sure that loving feelings will follow. 3. Consistency is key. Steve and I wanted our children to feel safe and comfortable and to know what to expect from life in the Whitacre home. So we tried to be as consistent as possible in our speech, our habits, our affection, our rules, and in particular, our daily routine. As soon as they got home, we began to establish a general daily and weekly routine that paralleled what they were familiar with in Ethiopia. Following a simple daily schedule enabled us to stabilize as a family much faster than I expected. It didn’t take long before our children adjusted to the rhythm of life in our home and we were able to start adding activities such as sports or time with family and new friends. This may not be best for everyone, but it made a huge difference for our family’s peaceful transition. One of the many blessings of adoption is that it can help you to become a better parent. You can’t take anything for granted and so you have to be more intentional and proactive. You have to listen more carefully, observe more closely, express your love more consistently, maintain your authority more clearly, and—in order to do all of these things—pray more intensely. Adopting an older child intensifies your focus on your family, which makes you a better parent to all of your children. In an age of distraction and the dissolution of the family, adoption can greatly strengthen your family bonds. This is a precious gift indeed. 4. Choose one thing and hold steady. Everything is new for our adopted children, so it doesn’t help to throw a bunch of new rules at them too. Together with your husband, consider what is most urgent or will most serve your child, and make this your one priority. For example, our son, Jude, really bucked the daily routine at first. When it was time to sit at the table for meals or coloring, he sat with both feet off to the side, ready to bolt. He threw fits at rest time and expressed strong disapproval (some things don’t take words!) when we wouldn’t let him watch TV until the end of the day. But we had decided that this was the one area where we were going to hold the line and begin to teach him to respond with joy to our loving, God-given, authority. We let many other things go for a while, but remained cheerfully resolute in this area. Today, Jude not only thrives on our daily routine, but is happy and obedient in so many other ways as well. I’ll be honest: there were many times I was tempted to give up. I wanted my new children to love me, or at least like me a little, and with my husband back at work, I was the primary enforcer. I needed a lot of encouragement from my husband and mom to persevere, but I’m so glad we did. Today Jude and Sophie cheerfully obey, and our bond is stronger as a result of having clear and loving boundaries in the home. 5. Take the long view. One of my greatest hopes was that all four of our children would become close friends. But things did not start off well at first. Jack and Jude couldn’t play together for more than five minutes without getting into an argument. They are both oldest boys, both used to taking care of a younger sister, both used to winning. After several months of what felt like constant arguing, I despairingly told my mom that I thought it would never get better. She encouraged me to be patient. Keep helping them. It takes time. And she was right: it took a good year or more. Today my sons are really good friends. Sure, they have the usual brotherly spats, but they also genuinely love and respect each other. It makes me so happy to hear them laughing in their bunk beds at night or to watch them play football in the backyard (and I don’t have to go out once!). So, resist the temptation to despair too quickly, as I did. Progress may seem painfully slow, and certain issues will always remain (as they do with all of us! ), but if you patiently persevere, you will look back one day and be surprised at how much progress has been made. 6. Begin with the Bible. Adopted children, to one degree or another, have all experienced traumatic circumstances early in life, many unimaginably severe. My children probably experienced fewer traumas than most, so I am generally unqualified to speak on this topic. If your child struggles with significant trauma or extreme behavior, I would encourage you to seek advice from your pastor, medical professional, and if necessary, a biblically informed counselor. So I’m speaking very personally here, when I say that, for our family, we have been slow to psychologize, and have found that the best advice for parenting our adopted children is still plain, old-fashioned, biblical parenting advice. When I see my children as individuals, created in the image of God, with their own personality, strengths and weaknesses, and a life-history that has been sovereignly ordained by God, it helps me to be more sensitive and understanding of their weaknesses, and more hopeful for their future growth. 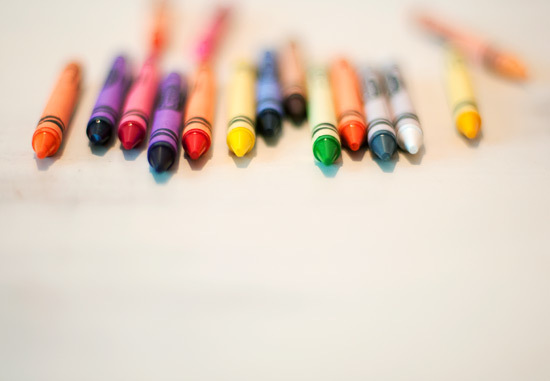 On the other hand, when I have been quick to slap a label on a certain behavior or say, “that’s what adopted children do,” I tend to get off track. I begin to see the behavior as much more unique than it really is, and thus more difficult (or impossible) to resolve; and as a result I can easily grow irritated or discouraged. But many times I’ve had to laugh as I’ve described a “unique” adoption problem to my family, only to have them remind me of how I exhibited similar tendencies when I was a child. Of course, she was right. And her answer encapsulated the most helpful advice I have received from other parents. Adoption may be difficult or complicated at times, but it is also beautifully simple. You are adopting a child, a unique and precious human being, with his own experiences and difficulties, strengths and struggles, gifts and talents, joys and pains. And God has called you to be this child’s mother, which is both utterly daunting and yet entirely doable by the grace of God. As an adoptive mother, you are not outside God’s sovereign plan, Scripture’s wisdom, or the Holy Spirit’s help for this task. Remembering this—that adoption means I am a mother—brings it all into focus: all of the privileges and joys, all of the responsibility and commitment, all the confidence and the hope we have in God as parents. It really is as simple and as wonderful as this: be his mother. That is my advice to you, and more importantly, Scripture’s counsel to you. God, the Father, models adopting love for us and through his Son, our Savior, Jesus Christ, we have been given all we need to be our children’s mother. My friend, this letter is already too long. There is so much more I could say. But most of all I rejoice with you. Children are a heritage and a reward, and God has been mightily good to you and your family. I am praying for much peace, wisdom, blessing, and grace as you welcome this precious boy into your lives. I can’t wait to see pictures! It’s the last day to order from 52home for guaranteed delivery by Christmas. Are you finding it hard to be happy this Christmas? Maybe you are lonely at a time when it appears everyone else has someone. Maybe you are dreading another tense and unpredictable family get together. Maybe physical suffering has drained your energy and enthusiasm for the season. Maybe, for a dozen different reasons, you are fretful and discontent. So often we step into the holiday season on the wrong foot. We abandon the paths of comfort and joy so clearly marked out for us in God’s Word and pursue happiness in the holiday instead. We hope that cookies and carols will somehow numb the pain or distract us from everything we feel is wrong with our lives. Or we just grit our teeth, plaster on a grin, and pray it’s over soon. But the way to peace and joy hasn’t changed because it’s Christmastime. Rather we have to be all the more intentional about seeking the Savior at a time when the distractions, and sometimes even the trials, are many. Consider the staggeringly glorious news that “when the fullness of time had come, God sent forth his Son, born of woman, born under the law, to redeem those who were under the law, so that we might receive adoption as sons” (Gal. 4:4-5). If we spend five minutes a day for the next twenty-odd days pondering the wonder of God become man to save sinners, we will be happy this Christmas. We will be happy because we will have hope. Christmas isn’t a temporary band-aid on the pain of life; it is the announcement of the cure for ruined humanity. The Christmas message is hope to the hopeless. Hope for sinners under the curse of the law. Hope for the orphan, estranged from God. And it is a timely hope and certain hope. If we are finding it hard to be happy this Christmas, the incarnation reminds us that our Savior has already purchased our everlasting joy. Christmastime is a busy time. There are parties to attend, gifts to purchase, wrap, and deliver, cards to send, and cookies to bake. And that’s on top of all the normal stuff we have to do! Something has to give, and sadly, our spiritual disciplines are often the first to go. We rationalize: “Things will settle down after the holidays. I’ll get back to consistent quiet times in the New Year.” But as the days move closer to Christmas, our hearts become colder toward the things of the Lord. And we wonder why we are so unhappy at Christmastime? “The precepts of the Lord are right, giving joy to the heart...they are more precious than gold, than much pure gold; they are sweeter than honey, than honey from the comb” Ps. 19:8,10 (emphasis mine). So as things get busy, let’s keep the spiritual disciplines at the top of our Christmas to-do list. Only then can we experience true holiday cheer. Christmas celebrations—intended to be joyful reminders of the incarnation—can quickly become exercises in selfishness. But selfishness is a one-way ticket to a Joylessville. That’s why the third habit for a happy Christmas is to serve others. The tricky thing is, I often think I am serving others at the holidays. After all, I am buying presents and throwing parties for other people, right? But my lack of joy when things don’t go according to plan reveals that I’m actually just serving myself. I want everything to go my way, to bring me happiness. I so quickly forget that the Christmas season is about the Son of Man who came: “not to be served but to serve, and to give his life as a ransom for many” (Matt. 20:28). True holiday happiness is found by rejoicing in his coming, and by his grace, emulating his example of servanthood and sacrifice. “You know the grace of our Lord Jesus Christ, that though he was rich, yet for your sakes he became poor, so that you through his poverty became rich” (2 Cor. 8:9). How can we make ourselves happy this Christmas? By making ourselves poor. By spending and being spent to enrich our fellow human beings. By seeking our own happiness in the happiness of others. If we are rich in serving this Christmas, we will also be rich in joy. Serving is essential for holding on to happiness this holiday season. But if we try to serve without relying on God’s strength, without meditating on His Word, without offering up prayers to Him, we’ll still be lacking joy. We must commune while we serve if we want to be happy this Christmas. Remember Martha in the Bible? How easily we morph into Martha at Christmastime! All service and no joy. But our Lord did not rebuke Martha for serving; He rebuked her for failing to choose the best thing (as her sister Mary had done): to sit at His feet and listen to Him (Luke 10:38-42). This doesn’t mean we are to leave the Christmas shopping unfinished and forget about cooking the big meal. We are still called to serve; but, as Charles Spurgeon suggests, “We ought to be Martha and Mary in one: we should do much service, and have much communion at the same time. For this we need great grace. It is easier to serve than to commune. Martha experienced the consequences of not communing with the Savior. But we don’t have to be anxious this holiday season. By meditating on God’s Word throughout the day, joy can be ours, even amidst the chaos and the crowd. Christmas is full of wonderful gifts, and not just those under the tree. We experience gifts of family and friends, food and fellowship, music and memories. But we often fail to enjoy these gifts as we should because we fail to remember that “every good and every perfect gift is from above, coming down from the Father of lights” (James 1:17). “Pleasures are shafts of glory as it strikes our sensibility….I have tried…to make every pleasure into a channel of adoration. I don’t mean simply by giving thanks for it. One must of course give thanks, but I meant something different…Gratitude exclaims, very properly, ‘How good of God to give me this.’ Adoration says, ‘What must be the quality of that Being whose far-off and momentary coruscations are like this!’ One’s mind runs back up the sunbeam to the sun….If this is Hedonism, it is also a somewhat arduous discipline. But it is worth some labour” (as quoted in, When I Don’t Desire God, by John Piper). May every gift we receive this Christmas, every pleasure we experience, cause our minds to run back up the sunbeam to the sun. May we contemplate the glories of the Savior who gave His only Son so that we might enjoy all things through Him. Happiness isn’t playing hide and seek for the holidays. It isn’t hard to find. Regardless of our difficulty or dread of the Christmas season, we can experience true happiness as we cultivate godly habits. That’s because our happiness is not found in the holidays, but “out of reach” of the holidays, in our Lord and Savior, Jesus Christ.